One of the first products your baby receives in a gift basket at the hospital is Baby Oil. Did you do your homework and discover what ingredients it contains that you probably don’t want to be putting on your newborn (or yourself, for that matter)? 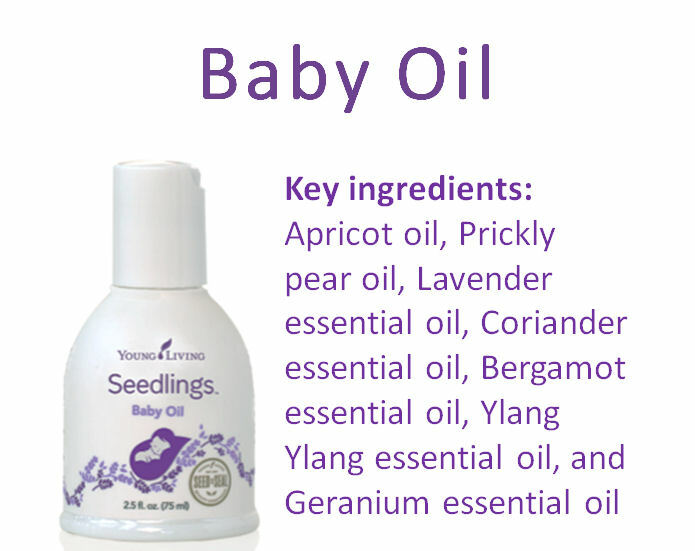 In contrast, Young Living’s Seedlings Baby Oil is formulated specially for an infant’s delicate skin. This mild, gentle product contains 100 percent pure essential oils diluted to an appropriate strength, and its naturally derived, plant-based formula is lightly scented with our Calm blend of Lavender, Coriander, Bergamot, Ylang Ylang, and Geranium. Check the ingredient list to see how it compares to the other brand. Go back to the Environmental Working Group’s website and I know you will be pleasantly surprised at how clean the Seedlings Baby Oil really is! The non-greasy formula moisturizes, soothes, and nourishes a baby’s skin. It absorbs smoothly; provides a light, calm aroma; and promotes a relaxing environment. Formulated without mineral oil, it is vegan friendly and suitable for everyday use. It is also dermatologist tested and hypoallergenic. Seedlings Baby Oil is formulated with “dry” carrier oils that moisturize and absorb quickly and thoroughly into the skin, leaving a baby’s skin soft, hydrated, and smooth after applying. Establishing a bedtime routine is very important in helping your baby get used to and look forward to restful sleep. Seedlings Baby Oil can be applied using baby massage techniques for sweet bonding with your little one. ← Let’s talk about babies!